Researchers at Texas A&M University recently received $1.9 million from the National Institutes of Allergy and Infectious Diseases as one of four U.S. institutions participating in the TB Structural Genomics Consortium to find possible new drug discoveries for TB, on a project titled "Structure-Based Discovery of Critical Vulnerabilities of Micobacteria". 2014 marks the third year that TAMU has received this grant from the NIAID, making the total received for this project $5.6 million. According to the NIH RePORTER: "The overall mission of the TB Structural Genomics Consortium is to determine the three-dimensional structures of proteins from M. tuberculosis (Mtb), prioritized by their relevance for drug discovery. Mtb, the causative agent of tuberculosis, remains a major-health threat worldwide, and structural information on relevant proteins is critically needed to support future drug discovery. Our Program Project focuses not only on solving structures of proteins in vulnerable pathways, but also complexes of drug targets with inhibitors bound, which will yield important insights about active-site interactions for drug design." Each of the four universities participating in the consortium will be responsible for studying different aspects of the Mtb protein. Texas A&M University will focus on solving "the crystal structures of core metabolic enzymes, including those involved in energy production, biosynthesis of amino acids and co-factors, and biosynthesis of lipid components of the cell wall." TAMU's work, combined with research from UC Berkeley, UCLA and UC Irvine will hopefully lead to the designing of new drugs to fight Mtb. The upcoming 14th annual BioResearch Product Faire™ event at Texas A&M University College Station is a great chance to exhibit lab supplies to active researchers. 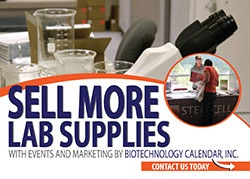 Biotechnology Calendar, Inc. has been producing life science tradshows at researchers universities around the U.S. for over 20 years, and has a great reputation amongst both researchers and exhibitors. Other shows in Texas and around the United States can be found on the 2015 lab product event schedule.